By Hemang Kotecha, D.O., Christopher Cerniglia, D.O. 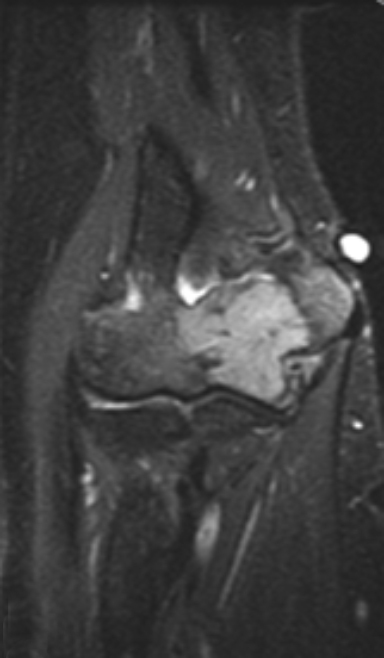 A 44-year-old woman with a history of Sjogren syndrome presented with 4 months of right elbow pain that began spontaneously, without any known precipitating trauma or injury. She denied constitutional symptoms. 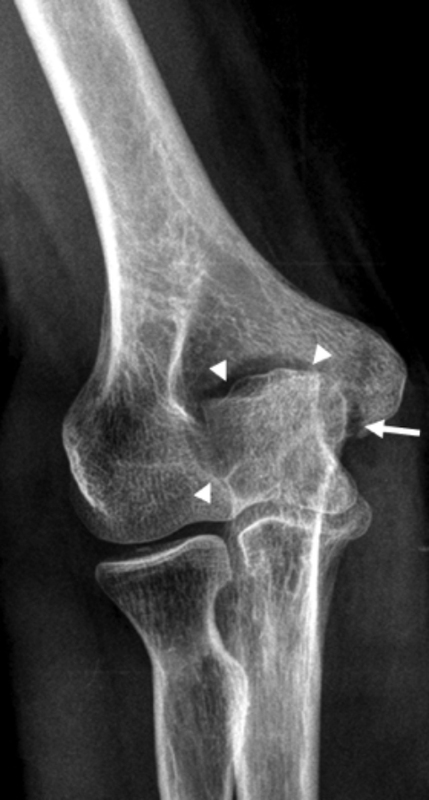 Radiographs of the right elbow (Figure 1A) were initially interpreted as negative at an outside institution. Her pain was attributed to inflammation and perhaps tendinitis, and she was sent to physical therapy. Ultimately, the pain did not improve, and an MRI was performed (Figures 1B-D). A systematic approach is necessary in providing an accurate differential diagnosis for osseous lesions. Plain radiographs are the mainstay for characterizing these lesions, especially in terms of having an aggressive or non-aggressive appearance. Key features to identify include the zone of transition between the lesion and surrounding bone and the presence of cortical destruction or periosteal reaction. In addition, lesion location and patient demographics play a critical role in establishing a reasonable list of differential diagnoses. The leading differential diagnoses for this solitary epiphyseal intramedullary lucent lesion with a non-aggressive imaging appearance include giant cell tumor, chondroblastoma, clear cell chondrosarcoma, and eosinophilic granuloma, although infection could have a similar appearance in the appropriate clinical setting. Giant cell tumor: Giant cell tumor (GCT) is a typically benign, locally aggressive, lytic lesion that is located eccentrically within metaphyseal bone and extends to the articular surface. Histologically, giant cell tumors contain a prominent and diffuse osteoclastic giant cell component on a background of mononuclear cells.1 The histopathological differential diagnosis of giant cell tumor is extensive. Therefore, careful correlation between clinical, pathologic, and radiologic features is necessary for accurate diagnosis. The majority of GCTs affect skeletally mature patients with a peak prevalence in the third decade. Approximately 80% of lesions occur in patients between 20 and 50 years of age.1 Clinical symptoms are nonspecific and include pain, swelling, and decreased range of motion at the adjacent joint. In instances of pathologic fracture,patients may present with acute onset of pain. Radiographically, location is the key diagnostic feature, as the vast majority extend to within 1 cm of subarticular bone. The knee is the most common site of involvement, including the distal femur and proximal tibia. On radiographs, GCTs classically exhibit geographic osteolysis, a narrow zone of transition, and non-sclerotic borders. The majority of lesions are eccentric in location; however, large lesions may appear centrally located. Computed tomography (CT) allows for improved evaluation of cortical thinning, pathologic fracture, periosteal reaction, and the absence of matrix mineralization. 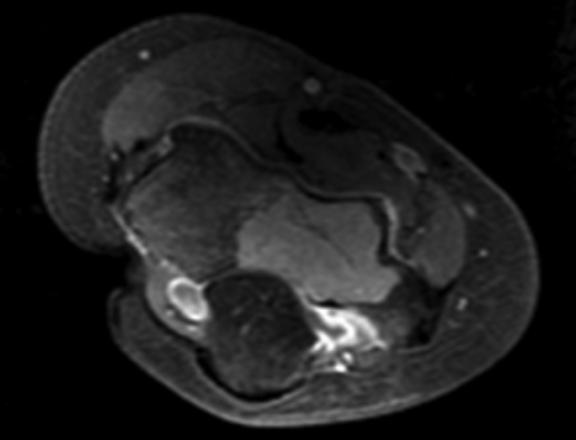 MRI is useful in the detection of the soft tissue extent of the tumor. The solid components of GCT demonstrate low to intermediate T1 and T2 signal intensity, differentiating this tumor from many other subarticular lesions. GCTs can also contain secondary aneurysmal bone cyst components, in which fluid-fluid levels are characteristic. Chondroblastomas typically occur in young patients with a mean age at diagnosis of approximately 20 years, but they can occur at almost any age.3 The incidence is greater in men compared to women. Patients often clinically present with pain, tenderness, stiffness, and swelling. 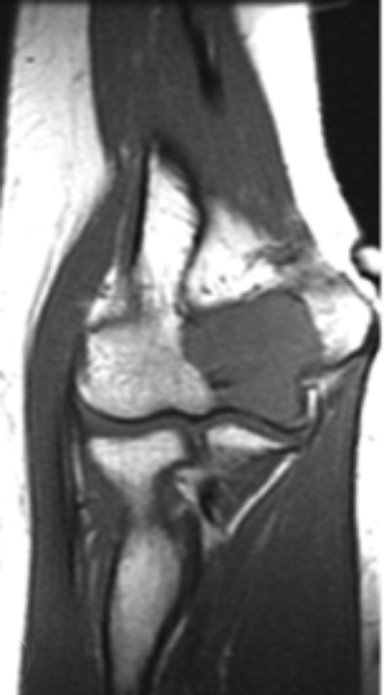 Similar to GCTs, chondroblastomas most commonly occur at the knee. Clear cell chondrosarcoma: Clear cell chondrosarcoma is 1 of 5 histologic variants of chondrosarcoma, which has a strong predilection for the epiphyses of long bones. Tumor cells range from immature chondroblasts to mature chondrocytes which have neoplastic cells containing clear cytoplasm and centrally positioned nuclei. Clear cell chondrosarcoma is a slow-growing neoplasm seen in patients with closed physes and a peak incidence between 30 and 40 years of age. Radiographically, clear cell chondrosarcoma is a lytic lesion, which may have sclerotic borders. Matrix mineralization is demonstrated in one-third of cases. Small lesions may be well-circumscribed, while larger lesions (> 3 cm) can have cortical destruction and soft tissue extension. Clear cell chondrosarcoma shows intermediate low T1 and intermediate high T2 signal with heterogeneous enhancement. When matrix mineralization is present, internal low T1 and T2 signal is often present. EG can have a variety of radiographic appearances. In the acute phase, they are aggressive-appearing lytic lesions with a wide zone of transition and may be difficult to differentiate from Ewing sarcoma or infection. Chronic lesions in long bones may also vary in appearance with some lesions presenting as a small area of medullary destruction with well-defined sclerotic margins. Other lesions may progress, causing endosteal scalloping, cortical destruction, and a soft tissue mass.5 CT is useful in delineating the extent of the lesion, presence of a soft tissue mass, and degree of cortical destruction. MRI has similar benefits, although the imaging characteristics on both modalities may be nonspecific and overlap with more aggressive lesions. Key features to assess in determining the aggressiveness of a bony lesion include the zone of transition, presence of cortical destruction, and periosteal reaction. Once the aggressiveness of the lesion has been established, the differential diagnosis depends largely on patient age and gender, as well as lesion location, multiplicity, and matrix calcifications. In our patient scenario, the lesion location and imaging characteristics were essential to establishing an appropriate differential diagnosis for an epiphyseal lesion. As with most cases, the final diagnosis was made based on a combination of the clinical presentation, imaging characteristics, and pathologic assessment. Murphey MD, Nomikos GC, Flemming DJ, et al. Imaging of giant cell tumor and giant cell reparative granuloma of bone: radiologic-pathologic correlation. RadioGraphics 2001; 21:1283-1309. Qasem SA, DeYoung BR. Cartilage-forming tumors. Semin Diagn Pathol 2014; 31(1):10-20. Douis H, Saifuddin A. The imaging of cartilaginous bone tumors. I. Benign lesions. Skeletal Radiol 2012; 41:1195-1212. Yamamura S, Sato K, Sugiura H, et al. Prostaglandin levels of primary body tumor tissues correlate with peritumoral edema demonstrated by magnetic resonance imaging. Cancer 1997; 79:255-261. Azouz EM, Saigal G, Rodrigues MM, Podda A. Langerhans’ cell histiocytosis: pathology, imaging, and treatment of skeletal involvement. Pediatr Radiol 2005; 35:103-115. Lytic Epiphyseal Lesion. J Am Osteopath Coll Radiol. Hemang Kotecha, D.O., Christopher Cerniglia, D.O. Dr. Kotecha and Dr. Cerniglia are with the Department of Radiology, University of Massachusetts Memorial Medical Center, Worcester, MA.